SM3 is a hash function designed by Xiaoyun Wang, et al. The hash is part of the Chinese State Cryptography Administration portfolio. Definition at line 27 of file sm3.h. Hashes which derive from IteratedHashWithStaticTransform provide static member functions InitState() and Transform(). External classes, like SEAL and MDC, can initialize state with a user provided key and operate the hash on the data with the user supplied state. Definition at line 230 of file sm3.cpp. 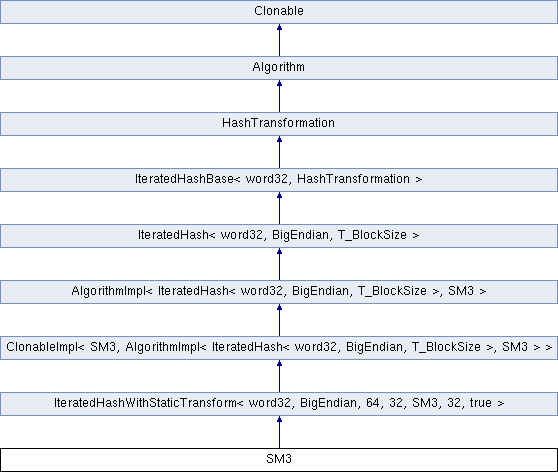 Transform() operates the hash on data. When the call is invoked digest holds initial or current state. Upon return digest holds the hash or updated state. Definition at line 240 of file sm3.cpp. Definition at line 53 of file sm3.h.